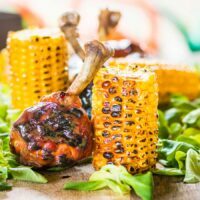 Dark Beer (Porter) and Honey form the base of the glaze on these BBQ chicken drumsticks which are served with simply grilled buttered sweetcorn. Beer and Honey BBQ Chicken Drumsticks! You will be forgiven for thinking that my kitchen is out of bounds this summer. These BBQ Chicken Drumsticks are part of my romance with my BBQ this summer. Sorry, not sorry! As far as I am concerned chicken drumsticks are perfect finger food, they come with a handle for goodness sake! These sticky drumsticks are not the first here on Krumpli. In fact, this older sticky chicken drumstick recipe was one of the first on my site. 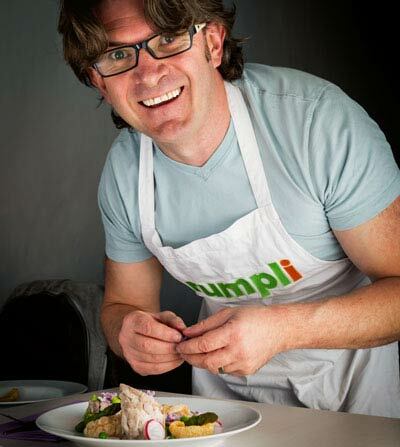 To this day it remains one of the most popular recipes here on Krumpli. The flavours on this bad boys are very different. Sure the sweetness remains but there is a very grown up almost nutty flavour on these beer glazed BBQ Chicken Drumsticks. That flavour comes from a wonderfully simple beer syrup. A syrup made using a very Britsh beer. A porter, the granddaddy of the stout most are more familiar with. In fact, these BBQ Chicken Drummers would work great with stout too and will move the flavour profile towards malty rather than nutty. I am a huge advocate of adding some skills to your repertoire as a cook. They save serious money add flare and really only require a bit of practice to master. One of the main drivers behind my site is to improve as a cook all ways round! ‘French trimming’ your chicken drummers is one of those wee little tricks that add a sense of fancy. It is, of course, optional but hey, if you can learn something new, then why not right? The video below teaches you how to break down a whole chicken. But if you just want to see the section on the chicken drummer scrub through to the 36 second mark! The removal of the skin which I think makes these chicken drummers much better, but just give it a tug it should come straight off. 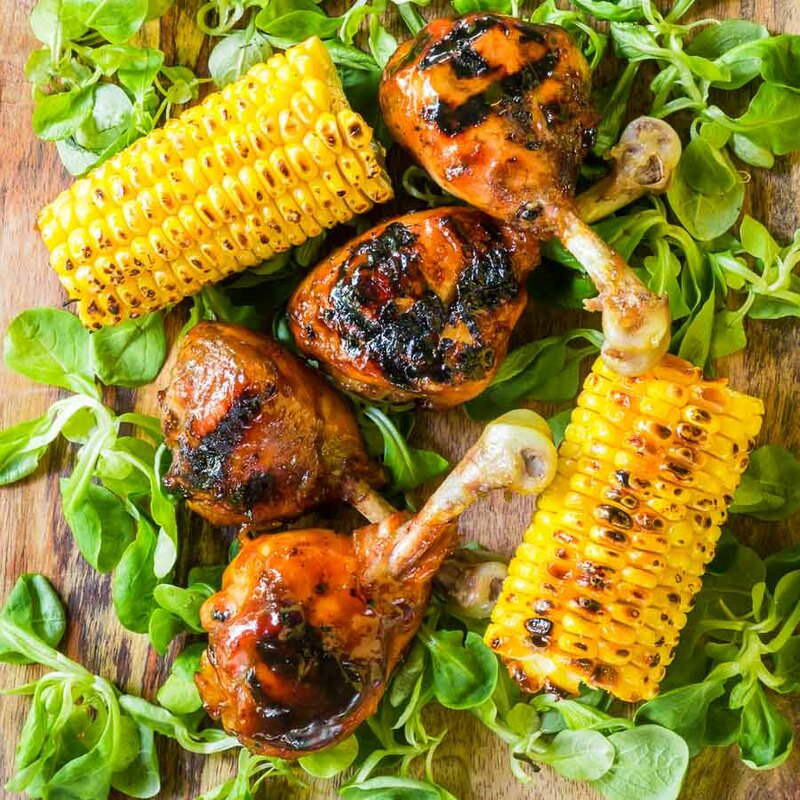 Naturally skipping this step will not change the flavour of this bbq chicken drumstick recipe at all, but it will save you on paper towels! Yes, that is very unlike me and yes I feel fine. The skin does not crisp up no matter how you cook these drummers, so it has quite an objectionable texture and I prefer to get rid of it. Whilst I am a self-confessed beer lover, I do not cook with it often. Although you are more than likely to see a beer in the background of my fakeaway recipes! It is, however, a great and versatile ingredient. I use a nice light pilsner lager beer in my traditional, not traditional British Fish & Chip recipe. Beer is great at adding a lightness to batters and I love using it. You can change it up for a floral and citrusy Weissbier as I do in my beer batter fish tacos for a different flavour profile! However, in these BBQ chicken Drumsticks the beer is there for flavour. Here we have the toasted nutty flavour that is less heavy than a stout. But as we have seen above different beers can make huge differences to recipes. Whether it by my beer roasted pork knuckle or braised pork meatballs in a beer BBQ sauce, the beer is the foundation of the recipes. If you are not too used to cooking with beer, break out of that comfort zone… It really is a delicious ingredient in the cooks arsenal! 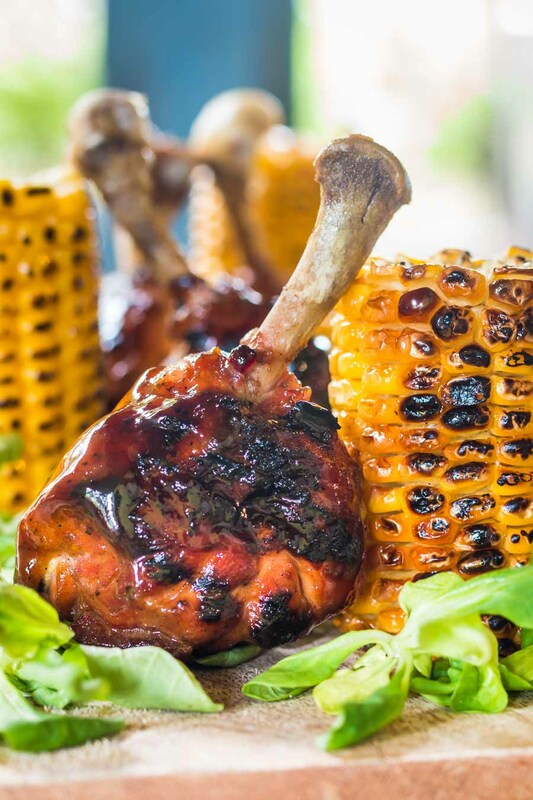 Dark Beer (a porter) and Honey form the base of the glaze on these BBQ chicken drumsticks which are served with simply grilled buttered sweetcorn. Place the beer, honey, sugar, and salt in a pan and reduce by half to get a nice dark beer syrup. Stir in your mustard and set aside to cool. You can make this glaze up a couple of days in advance if you wish. Prepare your chicken, I like to remove the knuckle as per the video a little further up the page as it helps with sticky fingers at BBQs but it is optional. For this recipe it is better to remove the skin. Mix together the flour and pepper and dip the chicken drumsticks in the flour to coat. Now drop in the glaze and rotate to cover. 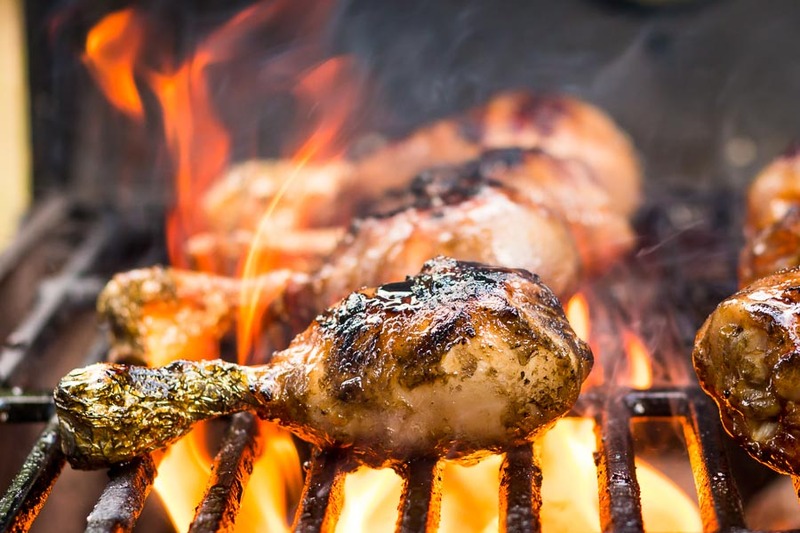 Oil up your grill grate and then drop on the chicken drumsticks over the direct heat. Keep basting the chicken and keep them moving to get a nice colour on each drumstick. Move to the indirect heat and close the lid, then cook for 30-35 minutes or until the internal temperature reaches 73°C or 165°F. When the chicken reaches around 65-68°C, drop the sweetcorn over the direct heat and keep moving. Baste with melted butter whilst doing this. These sound just incredible. I love a good grilled chicken leg. I don’t make mine fancy (I’m lazy), but your look so good! The flavor just sounds amazing! We’ve been enjoying a lot of BBQs here in Scotland, which is unusual as our summers are usually quite wet. Love grilled corn. These drumsticks sound divine! Such delicious flavours, perfect for the BBQ. They definitely float my boat! 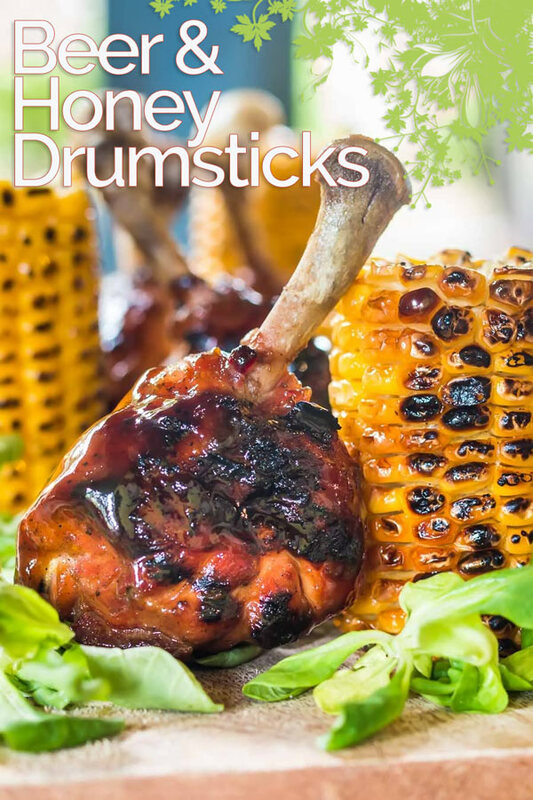 These drumsticks are absolutely stunning especially when they are getting roasted on fire. I love love love that you have french trimmed these. I would never have thought of doing it myself but it makes so much sense now! Ll be doing that for all drumsticks going forwards. excited to try this beer based glaze too. It sounds like the perfect BBQ recipe.